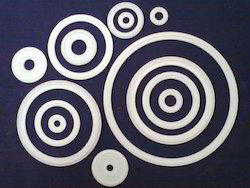 PTFE T/c Gasket, Size: 1" To 8"
TC Gasket are available in various material as per the process requirements like wise PTFE, Silicon, Viton, Neoprene, and others as per requirement. This Gasket performs important task of leak free assembly TC Gasket are available Ex-Stock from size ½ to 10 in NB and O.D size. Owing to the rich industrial experience and expertise in this business, we are involved in providing TC Gasket. - Our product range are unique from competitors market as we make Handmade gaskets. - We can also deliver 1 pc to our customers who can directly come to our door step. - We Make gasket from different different materials like - Copper, Aluminium, Lid, Metal & Tin etc. These products are valued by customers for higher chemical stability.